One of my favourite trees here is this African podocarpus. It must be fifty years old by now and stands some 8 metres high. About 25 years ago, we built part of our nursery around it but we made sure it remained unaffected. Now, as we turn that nursery area into garden, we are really pleased that we kept it as a feature tree for our planned Palm Walk. You can’t hurry up maturity on slow growing trees. Not that it has any connection to palms but it fits right in to that slightly exotic theme. Henkelii comes from the Eastern Cape and Kwazulu-Natal area of South Africa. In the wild, it now has protected status but it is common as a garden plant in its homeland because it is an elegant, slow growing evergreen tree. It is commonly referred to as the Yellowwood because its timber is apparently yellow and excellent for making furniture. This may account for it needing to be protected. The narrow leaves measure over 20cm long and hang in a sickle shape. We know ours is a female because it produces plenty of seed which looks like green olives but as henkelii is dioecious, it needs both male and female plants to get fertile seed. In other words, the seed from our tree is sterile because it is a solitary specimen. The podocarps are a big family and widespread, though mostly from milder areas south of the equator. Our native totara is a member. 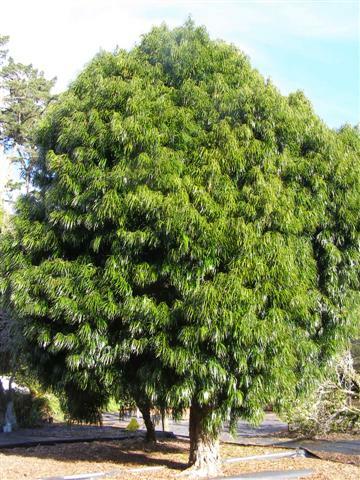 This entry was posted in Plant collector and tagged gardening, Mark and Abbie Jury, Podocarpus henkelii, The plant collector, Tikorangi: The Jury garden, Yellowwood on 20 May 2011 by Abbie Jury. 1) Early, frilly and fragrant – one of the first rhododendrons for this season is R. cubittii. 2) Exotic trees versus native plants – Abbie’s column (spare me from politically correct ignorance). 4) In the garden – tasks for this week. I was listening to a radio interview last weekend with Peter Arthur, a keen dendrologist and NZ’s foremost retailer of garden and plant books. In a country where it is currently quite difficult to sell any plant which is not a vegetable or a fruit tree, he was asked to predict what the next big gardening craze will be. He didn’t hesitate: trees. A return to trees. I thought of Peter’s comment as I looked at a beautiful specimen of Podocarpus henkelii. When Mark established the nursery here, he worked around existing trees on site so we have tended to have obstacles – a citrus tree amongst the vireya rhododendrons with the overhead shade cloth cut around to fit, an eriobotrya in the hosta block – and this magnificent African podocarpus set amongst the capillary beds. Now the day has come, as we wind up the nursery, that the capillary beds will go and the P. henkelii will be accorded the status it deserves as part of a planned new garden. It will have to share the limelight with the planned Palm Walk but it has at least four decades on the palms and will no doubt retain its status as the senior plant in this new area for our lifetime. I hope Peter Arthur is right and we will see a wider appreciation of the magnificence of trees. A utility apple tree is not, I think, a match for our P. Henkelii. This entry was posted in Tikorangi notes and tagged Abbie Jury, Podocarpus henkelii, Tikorangi: The Jury garden on 16 July 2010 by Abbie Jury.